By Lindsayt	| Published on Tuesday, April 19, 2011. Gaia is a smart and talented artist who has already accomplished a lot and is only getting started. So read, listen, and see what Gaia has to say in part 1 of our interview. FatCap Editorial Assistant Brock Brake brings the FatCap commuity an exclusive on Gaia. Make sure to check out both videos (1, 2) and follow him on Twitter & Vimeo. Gaia is a street artist from Baltimore who was recently brought to Chicago in March for gallery shows at Maxwell Colette and Pawn Works. In partnership with the galleries, we were able to spend a couple weeks with the young street artist as he prepared for both shows and worked on different projects around the city. One project we tagged along was with the Chicago Loop Alliance in an abandoned federal building on State St. and Morgan St. in the display windows. Another project was a mission to get up on the last standing high rise housing project of Cabrini Green. So who is Gaia and where did the name come from? Gaia is the personification of the Earth in Greek Mythology. It is mother nature. It was an intuitive choice that served as the impetus for this project that I have now made into my life. You grew up in New York, but you go to school in Baltimore. What made you select Baltimore over the big apple? Baltimore is family to me. New York is about making moves and getting fucked up. What are your plans once you finally conquer school and graduate? Where are some of the your favorite cities you’ve worked in? Chicago was pretty fantastic considering there were so many spots on the street that were plywood. Also it was a pretty incredible moment in the history of public housing considering the demolition of the Leclaire Courts and of course, Cabrini Green. Atlanta is hot and exhilarating, Miami is like teal heroine, Baltimore is cold and ugly, New York is pure hype, San Francisco is cheerful and compact, Los Angeles is almost too widely slumped across that valley to even make an impact, St Louis is strange, Philadelphia is wonderful, Greenville is quaint, Tucson wasn’t much, Jersey City is cute, Mexico City is wild, Barcelona is fancy… the list goes on. As an artist how important is collaboration to you and your work? You said you were working on something with Martha Cooper? Collaboration with me is a mutual agreement between two individuals. I do not subscribe currently to the notion of collaboration as a method for escaping authorship. You use a variety of animals in your work. Do the different animals have different meanings? The animals within my work serve as an entrance into the work. Each one functions as a conceptual metaphor. The Lion Rabbit, and other animal hybrids all contain specific significance are generated by site. 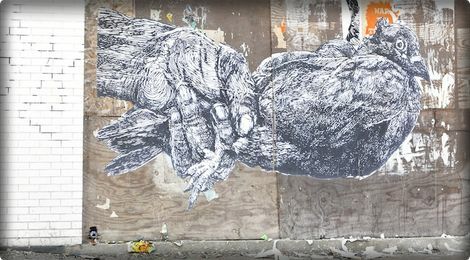 Do you ever use anything else on the streets besides your wheat paste? I feel like I’ve seen work you’ve done with different paints. I do legal spots with various paints. If there is a budget then I prefer to obviously use high quality colors. But its been hard to come by for me. It seems American artists just don’t have the same support as Europeans when it comes to legal walls and supplies. If there is paint left over from a project its always nice to catch flares wherever.